and pressed on for nuclear talks. After 68 long years, the Korean War may finally, technically, come to an end. Though the fighting officially stopped in 1953, North and South Korea never signed a peace treaty, a technicality that has highlighted the conflict between the once-united nations for decades. But a historic summit between the two leaders of the countries this week may have altered that relationship forever. official talks of peace and denuclearization. The historic meeting between the leaders of North Korea and South Korea is forcing critics of President Trump to acknowledge that his much-derided strategy might be bearing fruit. 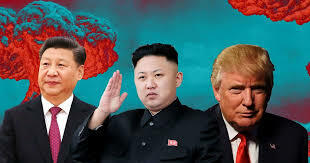 Trump’s approach to North Korea, including his famous derision of its leader Kim Jong Un as “Little Rocket Man” and his talk about the size of his nuclear button, elicited a combination of fear and mockery from foreign policy experts and other elite voices. So too did his threat during a United Nations speech last September to “totally destroy” North Korea. eradicating ISIS and getting North Korea to denuclearize. What we have today is a State Department that is consistently pro-Arab and globalist in its reflexes, and that too often marches to its own drumbeat – a CIA whose incompetence is legendary yet does not blink in secretly meddling in the affairs of governments here and abroad, a politicized FBI and Justice Department, a radical EPA, and so on. flag. According to city ordinances, the military flags were against code, which is what led city inspector Melinda Powers into their store on Monday. President Donald Trump announced on Monday that he has directed the Department of Homeland Security to block a large group of migrants from Central America seeking to enter the U.S. that have begun arriving at the U.S.-Mexico border. comprise 49 pages of approximately 300 text messages. report should be read carefully and heeded by those who can make that happen in Washington. But whether or not it will remain to be seen. For the seventh consecutive year, American Renaissance will hold its conference at the park, where the organization rents out the state-owned hotel’s 125 guest rooms and fills the 300-seat conference hall with attendees. The Trump era has been very good for the group’s fundraising efforts. The SPLC’s already impressive endowment grew a staggering 35 percent in fiscal year 2017 to more than $432 million. Including operating funds, total assets topped $477 million as of October 31, 2017. Total revenues and gains in fiscal 2017 exceeded $180 million, more than triple the organization’s expenses for the year, of just under $60 million. A fortnight ago, Viktor Orban and his Fidesz Party won enough seats in the Hungarian parliament to rewrite his country’s constitution. To progressives across the West, this was disturbing news. U.S. elites may babble on about “diversity,” about how much better a country we will be in 2042 when white European Christians are just another minority and we have become a “gorgeous mosaic” of every race, tribe, creed and culture on earth.